The Echoes of Those Before, by James Daniel Ross – book review by Fred Patten. The Echoes of Those Before, by James Daniel Ross. Illustrated by Josh Parise. Clairton, PA, Copper Fox Books, May 2015, trade paperback $11.99 ([3 +] 256 pages), Kindle $2.99. “In a broken world, in a broken land, there lay the shards of a kingdom. Near the center of that lost kingdom, protected by mountains, there lay a vale; along the river resided the five villages of the Fox Folk: Iceriver in the cleft of the hills where sun rarely shone; Oxbow, where the fishing was best even if done through the ice; Rocklake, where lived the steaming mud pits and the elder, where matters of law were discussed; Springvale at the entrance to the vale where the merchants and craftsmen met incoming caravans, and Sunrise, high on the slopes. 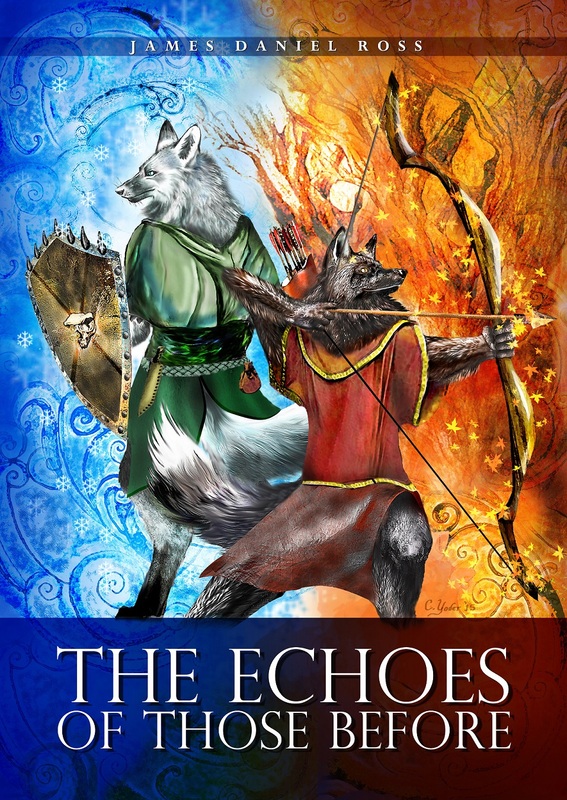 The Prologue and the first chapter introduce the main characters, Iam the white-furred Fox and Maverus the black-furred (shown on the cover by Christina Yoder) of the Fox Folk. They also establish that the Fox Folk are not the only Animal Folk, and that they have counterparts among the regular animals. Chapter 1 is titled “All That Came Before, Will Come Again”. The book is mostly Iam’s and Maverus’ story. Iam is a stereotypical omega character among the Fox Folk, an insecure ignored orphan (not that his parents are dead, but they left the village years ago), picked upon by all the bullies. Only Maverus stands up for him, and that’s less out of real friendship than because standing up for puny Iam gives Maverus a socially-approved way of showing off how strong and kindly and protective he is. The village guardian was very old and clearly could not last much longer – in fact, as The Echoes of Those Before begins, she has just died – and the brawny 16-year-old Maverus plans to make himself the obvious choice as her replacement. The reader can guess that things won’t go as Maverus expects. Fortunately, there is not much of this. The Echoes of Those Before will leave the reader waiting for volume 2. Recommended.